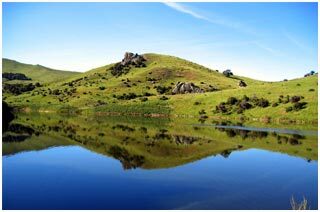 The Ballochdale Estate is a beautiful vineyard set high in the hills of the Awatere Valley in Marlborough. The soils are superbly suited for the growing of Pinot Noir and Sauvignon Blanc. It lies about 25 kilometres inland from the sea and 300 meters above sea level making it one of the highest vineyards in the Province. To the west lies the ever changing Birch, a hill over 5000 feet high and then to the south the magnificent Mt.Tapuaenuku rising up to just under 10,000 feet. The vineyard is on this isolated peninsular of land that is surrounded by very deep ravines covered in native bush which is a 30ha. conservation area closed to grazing in 1992. The vineyard water is sourced from the privately owned dam situated in a small conservation block back in the hills above the vineyard. The water which is sourced from winter runoff, comes down by gravity to the vineyard. This is an area that was once a dry old bit of hill which now abounds with a varied array of waterfowl. One fundamental focus on the farm and vineyard has been to enhance biodiversity and sustainability with the planting of many trees over the years and the regeneration of native bush. This has led to a very healthy population of native and game birds. The altitude, the inland climate, biodiversity along with the soil types creates a healthy, harmonious environment conducive to the creation of wines of great intensity and individuality. People are always stunned by the setting when visiting the site.